Cancer drugs are becoming impressively diverse in terms of their numbers and biological functions. This level of pharmaceutical development has arisen in response to the many types and subtypes of cancer that we are aware of. Some estimates indicate that there are approximately 1200 novel compounds currently under evaluation as therapeutics in the US. Whilst this is great news, some drugs may not exhibit the same efficacy in cases of the same cancer. This is a serious issue for oncology medical professionals and researchers, as it may lead to the reduced response or even failure of treatment in the real world. Such a disparity in the actions of the same drug may be linked to subtle differences between tumours of the same type in two separate individuals. This phenomenon adds quite a level of complexity and adversity to diagnosis and treatment in oncology. Today, it is addressed by matching the genes for specific disease biomarkers with the drugs that target them effectively. This process was informed by large-scale investigations such as the Cancer Genome Project (CGP), which tested an average of 368 lines of known cancer cell types for sensitivity to a total of 130 chemotherapy agents. Modern-day medicine mimics the process involved by assessing the genome of cancer cells isolated from biopsies for genes that indicate susceptibilities to these drugs and more. One problem though, is that the datasets derived from these genomes are huge, and require refinement to focus on the often extensive panel of mutations that contribute to the pathology and progress of the cancer type in question. This process could be subject to errors and omissions if it was left to humans alone. Therefore, machine learning is now often employed to identify the genes that may indicate either sensitivity or resistance to drugs that apply to each individual cancer type. This form of AI can develop its own novel features that enhance its functions or abilities as it goes along. In this case, the AI systems can find association types that differ from those it was initially programmed to identify. For example, regression-based algorithms used in the course of the CGP found within-group associations with drug sensitivities, rather than the associations across these groups (i.e. tumour types) as expected. This was a pivotal moment for the idea that genomes may differ for two apparently identical tumours. Therefore, AI may play a critical role in the whole-genome analysis of tumours and that of their ideal treatment options. On the other hand, older algorithms may depend on either measuring the strength of the association between each drug assessed and every individual gene (which may not be robust enough to be replicated with different datasets or conditions) or performing a specific type of regression (known as elastic-net or penalised regression) analysis on each drug using every applicable gene as a potential target (which may increase the risk of false-positive associations). Subsequent studies have tried to address this by ‘inputting’ more relevant data sets and types into AI systems. These may include relevant information such as the mutation patterns that are known to drive or be strongly associated with tumour development; the regulatory signals involved in disease progression and/or normal tissue function or specific epigenetic changes (which occur in many cancer types). For example, correcting for single-nucleotide polymorphisms (SNPs) that are strongly associated with cancer development has enhanced the identification of true-positive associations in previous studies, even for disease markers that were not included in the initial analysis. 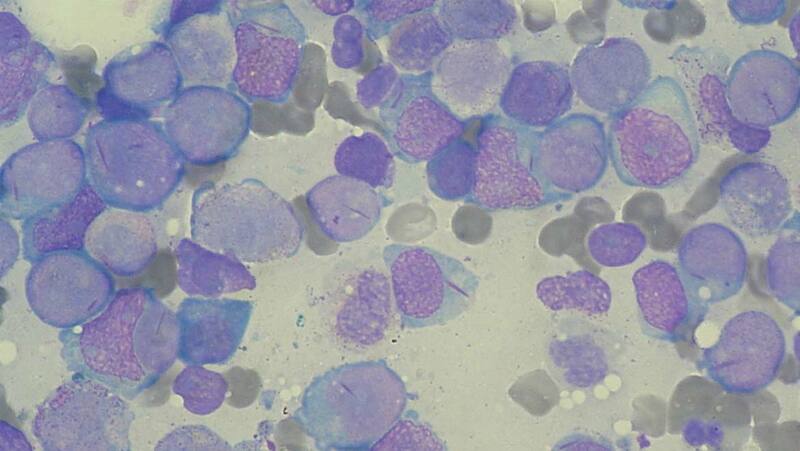 A recent paper, published in the January 2018 issue of Nature Communications, described the development of a machine-learning system to re-assess drug targets in cases of acute myeloid leukaemia (AML). The authors, working at the University of Washington’s School of Computer Science and Engineering, Department of Genome Sciences, Division of Hematology, Department of Medicine and Institute for Stem Cell and Regenerative Medicine, Centre for Cancer Innovation or Quellos High Throughput Screening Core; Sage Bionetworks, and the Fred Hutchinson Cancer Research Center (all of which are located in Seattle), also decided to take their system in a more varied direction compared to previous AI models of whole-genome assessment. Therefore, their algorithms incorporated information that is strongly linked to AML and its development. This data included a panel of copy-number variations (CNVs) typical to the disease, as well as a specific subset of gene methylations. It also specified several important regulatory genes in AML, as well as some characteristic gene-expression patterns. This AI modality, which the researchers termed MERGE, was ‘trained’ to identify how these features drove disease activity in AML, and also how each gene in an AML cell would function as a biomarker or drug target. As a result, MERGE was able to extrapolate the role these genes would play in previously-observed drug actions. The researchers claimed that MERGE was superior to other forms of AI in the accurate ‘pairing’ of drugs to target genes. MERGE was also able to verify the gene SMARCA4 as a marker of susceptibility to the drugs etoposide and mitoxantrone, which treat AML by inhibiting the enzyme topoisomerase II. MERGE was able to identify these associations by incorporating data on AML from previous studies, as well as genome-wide data from 30 patients with AML who were recruited for this study. This data was also compared to data on a total of 160 drug types, some of which were effective in approximately 50% of the patient group. The AI also validated known associations between certain genes and the drugs that were designed to target them, and the association between complete remission in some patients and the efficacy scores of their treatment regimens. Therefore, this study has demonstrated the potential of AI in whole-genome cancer studies. In addition, systems such as MERGE may now be ready to assist oncologists and clinicians in the development of treatment plans for patients in the future. This study has also shown that AI can predict responses to the same drug across patients with the same condition, while identifying the biomarkers that determine these responses. All in all, this emerging method of computer-aided medicine may boost care and (hopefully) survival rates for patients with conditions such as AML in the future. Lee S-I, Celik S, Logsdon BA, Lundberg SM, Martins TJ, Oehler VG, et al. A machine learning approach to integrate big data for precision medicine in acute myeloid leukemia. Nature Communications. 2018;9(1):42. Li C, Li M, Lange EM, Watanabe RM. Prioritized subset analysis: improving power in genome-wide association studies. Human heredity. 2008;65(3):129-41.